Play games with your taste buds with a twist of ginger, the sweetness of raisins, and earthy tones of yam. Great served on it’s own, as a side to a burger, or wrapped in a rice tortilla! 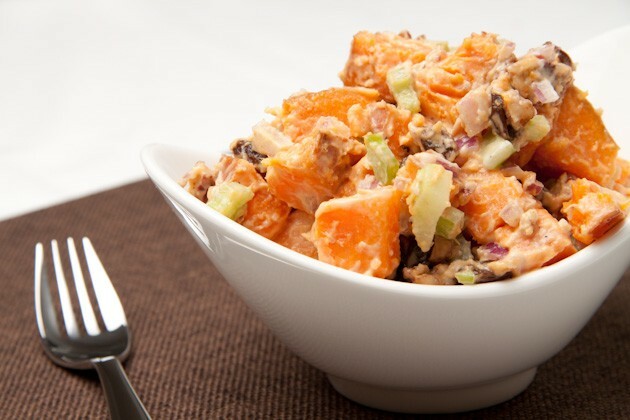 2 medium sized sweet potatoes, diced into 1/2 inch cubes – don’t peel! Fill a large sauce pan of water, cover and bring to a boil. 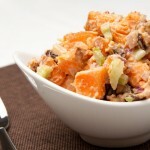 Place diced sweet potato in pot and cook for 8-10 minutes. Remember: you don’t want them too soft! After yams are strained and rinsed, add to the large bowl and mix until just combined. Serve warm, or cold. Either way, it’s delicious!